I write from a shared room in Batumi, Georgia after crossing through 4 countries in 4 days with our new recruit – Sam. After veering north into Romania, a slight diversion to our projected route to Australia but well worth the detour, stacking functions with DJ sets at the festival in Bulgaria and our first permaculture teaching experience, we are back on track and more east than we have been so far. I think we proved that travel can be cheap(ish). I’m not sure what it would have cost to fly from Romania to Georgia but we certainly managed it on a shoe string; Beclean to Bucharest on the overnight train (no bed) for £15. 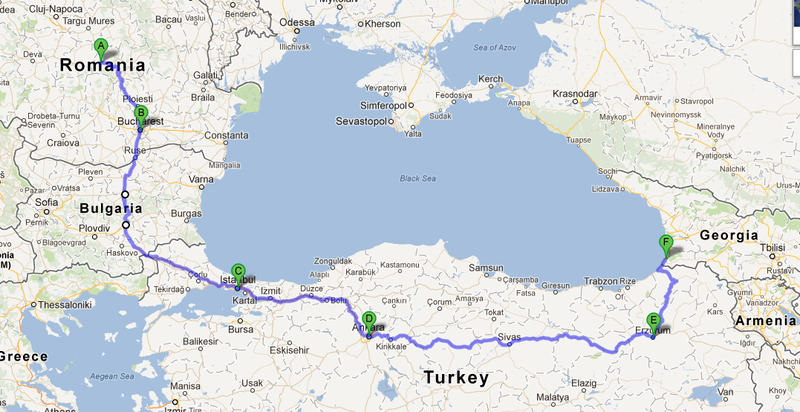 We killed a few hours in Bucharest then hopped on an overnight bus to Istanbul for £28.60. Not much sleep on that one and a strange sense of being persecuted for being smelly! Enough time in Istanbul to stock up on dried fruit and lukumi before departing to Ankara on a five hour bus ride – £8.50. We learnt a good lesson in Ankara and made our train by a matter of minutes. We boarded the Dogu Express for a 22 hour journey along the Euphrates river at 7pm two days ago – £16.00. Our last night in Turkey welcomed a full on slap up meal – tastey – before bus, bus, minibuses all the way to Georgia!!! £13.70. This entry was posted in Diploma, Environment, Food, Health, Permaculture, Travel and tagged Bucharest, Bulgaria, Bus, Georgia, Istanbul, Romania, Shoe String, Train, travel, Turkey. Bookmark the permalink. Go you stinky travellers, go!